Temple Cinema is available to host your varied events for school, fund raising, or business meetings. We have two clean, comfortable theaters with about 200 seats each and a well-trained and eager staff ready to make your get-together succeed without a hitch. If you have an idea for something you would like to use us for, please give our manager, Jeff, a call at 207-532-7600 or email us at Temple4TA (at) Outlook.com. If you want to see the movies that we are currently exhibiting as a private showing we need to charge each person the $7 matinee rate. We cannot show a DVD and charge (or have you charge) for admissions. If you want to have a party (not open to the public) and show your own DVD at the theater in our off hours we can accommodate you. We also have the capability to connect a laptop to our projectors so you can give truly stunning presentations. Everything that is booked must end an hour before our regular show times. Groups in need or in preference of Open Caption (subtitles) for any film we are currently exhibiting may request a special showing provided there are 35 or more individuals in attendance. 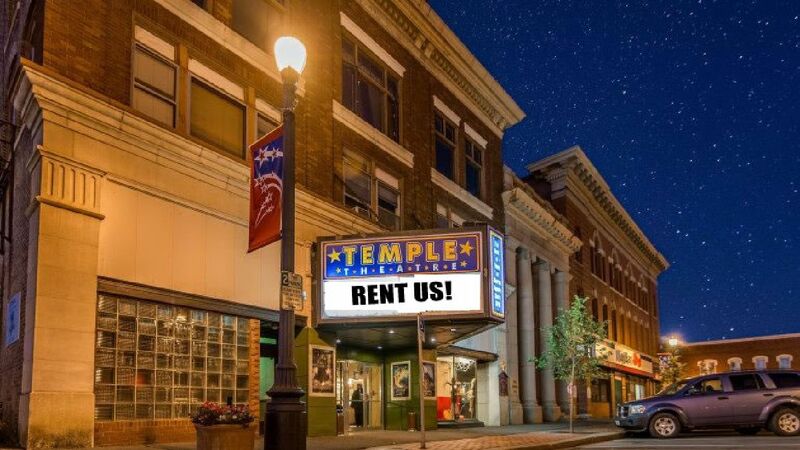 We will waive any theater rental fees in excess of normal admissions. Requests must be made one week in advance to allow for staffing. We charge $100 for children's events if you buy our concessions and $200 if you don't. For adults functions it is $100 per hour with a minimum of two hours with or without concessions. Private showings are for a minimum of 40 people and must be scheduled a week in advance. If you have an idea for something outside the usual, let us know and we can always discuss terms tailored to your requirements. Maybe you aren't big on dancing and want a movie-themed wedding and have us partner with a local caterer? Maybe you want to throw a special surprise retirement party with a tribute video projected on the silver screen? Who knows? Whatever it is we are sure to help you have fun! Did you know that if you want to buy our delicious popper-fresh popcorn, we sell it for $15 per huge kitchen sized white bag? Well, we do! Keep us in mind for your party or event.